Looking for instant leads and results? Google Advertising is your answer. At Click You we can help you be at the top of the search results using Google Adword’s Advertising. With Google dominating 93.12% of the Australian search engine market, it is a guaranteed way that Click You can help you grow your business today. Your Google campaign effects are immediate with top of page results targeting your customers immediately. Only pay for valid clicks to your website which are reviewed by Google directly. Our constant campaign management targets only the most relevant traffic to your website. We’ll work together to target relevant, profitable keywords for your business. Let’s get specific, nitty gritty with numbers and turn those clicks into calls. You don’t need to make design or content changes to your website for PPC. Over 67% of Australians use smartphones with full internet capability. We’ll set up a mobile click-to-call campaign to allow them to call directly from their smartphones. We’ll show you what the current keyword prices are and agree to a specific budget suitable for your business. Our clients come back because they get results. 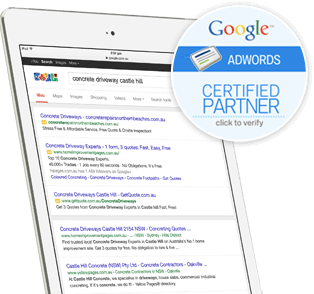 Is Google Advertising right for your business? Using Google, Click You can help connect your customer to your business at the exact moment that they require your products or services.